As I loaded this game up I was fully expecting Kenny Loggins’ instantly recognisable 80’s classic to start thumping away throughout a montage of crashes and explosions. The fact that the song and this game shared the same name was, in my eyes, surely more than a coincidence. Sadly, after the developers’ and engine splash screens, nothing happened. The game just loaded up. In fact, there was no music at all, save for an engine reverberating in the Danger Zone facility. Danger Zone was not off to a good start. Thankfully, this lasted only as long as the menu screen because once the tutorial was in full flow, the game feels like slipping on a comfortable pair of slippers. 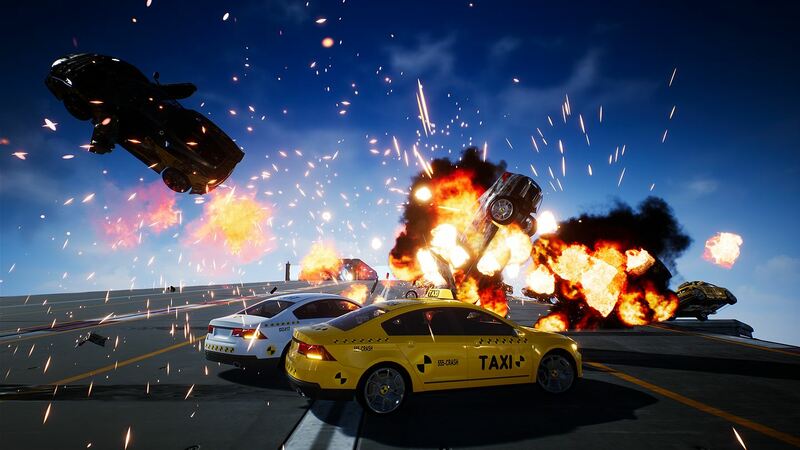 As a massive Burnout fan, Danger Zone feels like a continuation of the series’ iconic Crash modes because in all respects, it is. The team that founded Three Fields Entertainment were previous employees of Criterion Games so if anyone understood the nuances of the Burnout franchise, it was these guys. For those unfamiliar with Burnout, it was a series of arcade racers that featured races, demolition derby-type events on race tracks called Road Rage, and Crash events. Crash events were events where drivers had to charge full pelt from the start before hitting a ramp or intersection, with the primary objective of hitting oncoming traffic and causing as much destruction as possible. The more destruction, the more money the player earnt. The total amount earnt is then your score. It is as fun as it sounds and Danger Zone is the same Crash event, just now packaged into its own unique game. Of course, there are a few differences, and some not all for the better. 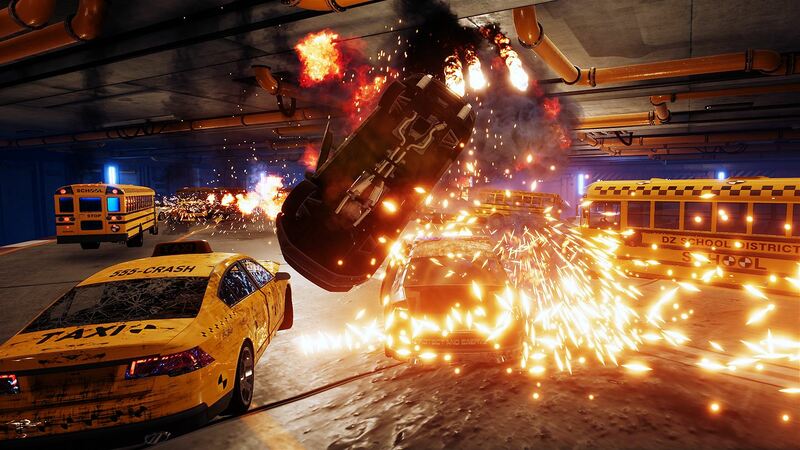 For a start, the location choice for Danger Zone is very bland with the game taking place inside a facility designed for the crashes, rather than real world locations as per the norm in the Burnout games. It looks pretty enough graphically but it doesn’t feel like there is much life to it, at least when compared with what come before it. 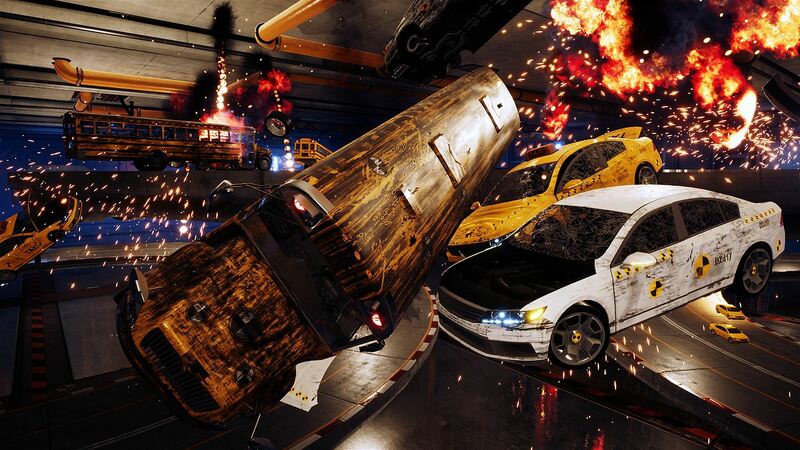 While it may seem unfair to compare this game to the likes of Burnout which, back in the day were big AAA releases, this is for all intents and purposes, the spiritual successor to all that. What isn’t an unfair comparison though is that this game only has 32 crash events and nothing else; Burnout 3, where this was one of several types of events, had 100 to choose from. Thankfully those 32 are 12 more than the game had when originally released back in May 2017 on PC and PS4. Another poor design choice was in offering six different drivable cars, but then preventing the player from being able to choose which car to drive. Danger Zone will load up the scenario with a pre-determined car, but they all appear to drive the same with the only difference being minor changes in speed depending on whether you are driving the F1 car or the taxi for example. But what is present is good, solid gameplay. It has changed slightly in that to achieve the Gold and Platinum medals, the pickups dotted around each scenario are now essential to collect. There are six in each level – three bronze, two silver and one gold. The gold only appears when all others have been collected, along with a number of Smashbreaker tokens, usually in the vicinity of a pickup. Smashbreakers, or Crashbreakers as they were previously known, also featured in Dangerous Golf, Three Fields Entertainments other Xbox One release and could be triggered when the requisite number of items were destroyed. Here in Danger Zone, they can be used to send cars flying in all directions causing more destruction by detonating your car. 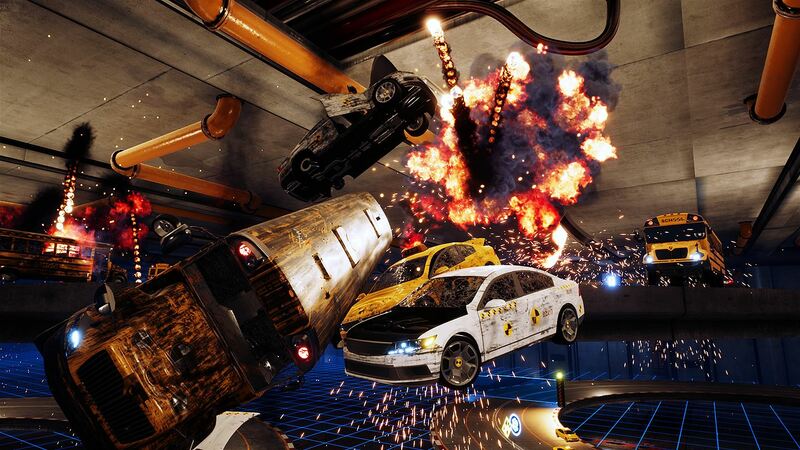 However, it is in your best interest to use the Smashbreakers to manoeuvre your car between pickups, as you can still control the direction your vehicle takes after detonation. Pick them up in any order and you get an additional $3.5 million to your overall score (each bronze is worth $100,000, silver $150,000 and the gold is $400,000 plus a $2.5 million Smash and Grab bonus) but pick them up in the correct order (bronze, silver and then gold) and the Smash and Grab bonus becomes a $5 million Grand Slam bonus. This is quite often the difference between struggling for a bronze medal and smashing the gold medal target such is the emphasis and impact of it. It may take away from the pure joy of smashing into cars and hoping for the best, but this feature adds a degree of puzzling gameplay as you literally plot your course between the pickups. That said though, overall, I found Danger Zone fairly easy to complete. The junctions are split into four zones and it was only the fourth and final zone that gave me any trouble. At this point the game starts throwing in junctions with at least three tiers to them and this becomes more of an exercise in finding the pickups rather than following them sequentially. Danger Zone has 13 achievements in total and it took me just over three hours to unlock them all. The most difficult one will be for earning 10 platinum medals. These are easiest to earn during the second and third tier junctions as they have more cars and Smashbreakers to boost your winnings. This is by no means a difficult completion though. There is also good news for the early adopters out there though, as this is one of the games that has been promised an Xbox One X update, allowing you to see your crashes in glorious 4K. Interestingly though, this update will also deliver six new crash junctions, so it isn’t simply an aesthetical update. If this is the plan to release more junctions down the line, maybe the initial purchase of £11.99 will eventually seem more worthwhile. 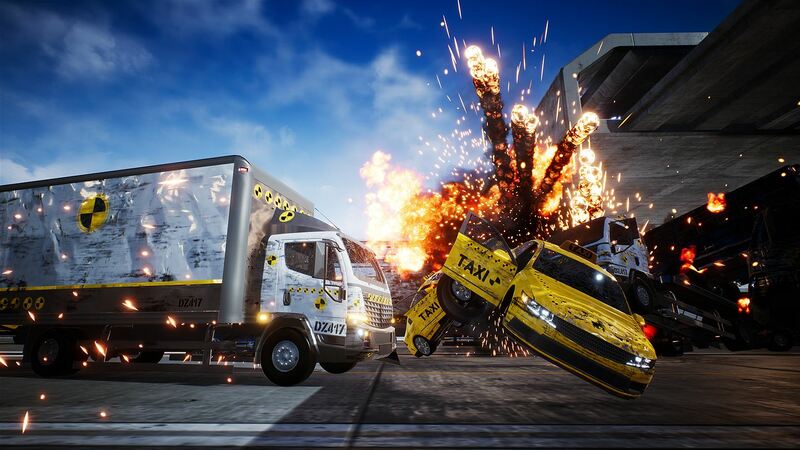 Danger Zone had the expectations of being a spiritual successor to Burnout, encompassing everything that was good about it. That gameplay is there, somewhere, but it gets lost between the generic level design, and over-reliance of pickups. That over-reliance does mean this is a mentally more demanding game than the crash junctions in Burnout were, but then it takes a huge leap backwards with precious few junctions and not even being able to select a car. This is a fun game, but for those looking for the same puerile fun from the crash junctions of old, this will only leave you wanting them even more.